Trouble is coming on the next page. 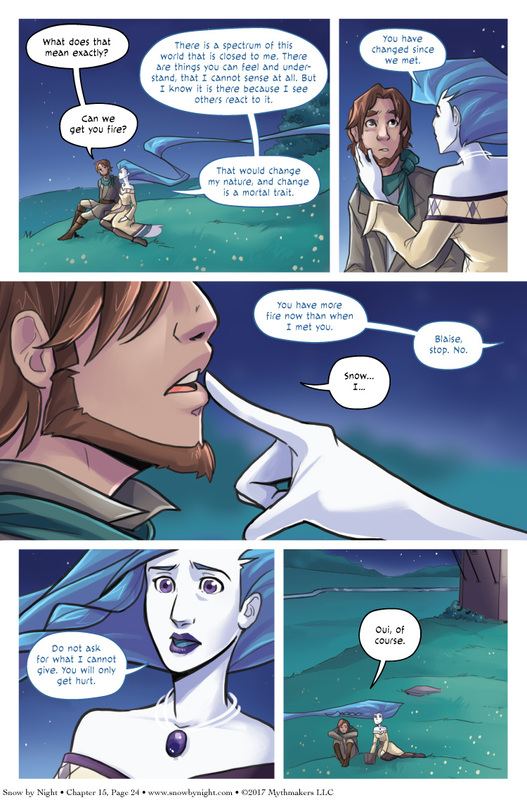 Please vote for Snow by Night on Top Web Comics to see the group’s reaction. The two continued to sit under the stars for some time. The clouds drifted across the sky, the windmill continued to spin, and the moment slipped away. She wants a heart, which would be a change. But change is mortal, not manitou. This constitutes a paradox. But paradoxical wishes are also human, not manitou. She also sought the help of an alchemist, a profession specialized in changing things into another. agreed. she doesn’t know herself well. More so, she doesn’t realize that her recognition about what he is going to say and how she would not be able to reciprocate is a change from when the fur trapper first fell in the pool. Yes, this is almost exactly what I came to post about. She already DOES feel for him in ways she didn’t before. Be interesting to see how this works out. We’ve already seen a spirit being spun into a human body – Cienan seems to know that trick. So it is possible for a spirit to become mortal. Snow wishes this, even if she does not yet realize it. In time Blaise will be able to ask for what she cannot yet give him. And then Winter’s words will have been prophetic. Ah, but we don’t know if that’s really what happened. What happens when that body is destroyed as her last one was? Does she die? Or is it more like what happened the first time, she reverts to her “real” self? I thought she was about to freeze his tongue unless he stopped talking. Want to bet Snow becomes human by the end of the story? I think she is probably going to die at the end of the story. Death is inherent to being human. … which is why I consider stuff like spirit becoming human the BAD ending. She looks worried and concerned in that last panel. Maybe I’m reading too much into it, but that seems like a change to me. Mmm, I can really empathize with Snow in that first panel there. Ah, but Snow my dear, you’re not thinking like a human meddler with things that are risky to meddle with. In the end it may matter far less what a manitou can’t give to a human than it matters what a human can give to a manitou. Mind you, there’s often a price, and the price is often disastrous and cruel, but that’s merely overwhelmingly likely, not certain.